“Cultural memory” is a political, social, and religious context that many people share when they recall a given work. An expert in Japanese art history, Professor Trede is often cited in the US and Europe by researchers in other fields as well. 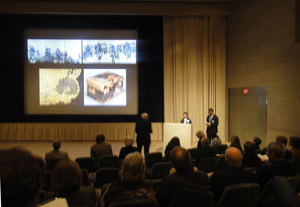 Her lecture examined the political nature of the Hachiman Engi by focusing on sources ranging from medieval picture scrolls to modern paper currency and was quite thought-provoking. A lecture by Mari TAKAMATSU (adjunct instructor at Meiji University) lasted close to 2 hours as a result of consecutive interpretation and was followed by a discussion chaired by Tetsuei TSUDA (the Department of Art Research, Archives, and Information Systems) featuring comments by Takahiro TSUCHIYA (researcher at the Tokyo National Museum) and Jun SHIOYA (the Department of Art Research, Archives, and Information Systems). The day’s program received positive reactions from researchers of history and Japanese literature. The lecture on the Hachiman Engi provided a valuable impetus for the exchange of opinions by experts in different specialties or experts specializing in different eras.